Select the Correct Model and Equipment Collocation. In the process, the high concentration slag eliminator is placed after the pulper, before the multiple fiber separator or the coarse screen. 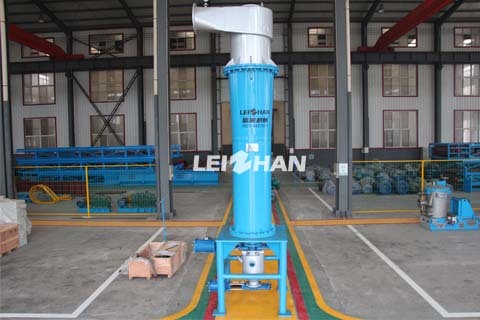 For high concentration slag eliminator, the pressure loss is small, so the grouting pressure can be increased appropriately, and the slurry can enter the equipment without passing through a slurry tank. The multiple fiber separator is a kind of high efficiency equipment which gathers the secondary breakdown, light and heavy impurity removal and screening in an organic whole. If the multiple fiber separator is not protected by a high concentration slag eliminator at the front, a large number of impurities directly enter into the multiple fiber separator. Some impurities have not yet reached the duplex fiber separator and then passed into the screening area through the sieve plate. This will affect the use of multiple fiber separators, at the same time, it will speed up the wear of multiple fiber separators screen plate and screen drum. If combined with high density cleaner, the above problems can be alleviated, and the heavy impurities can be arranged in order from big to small, from many to few, which improves the efficiency of the system.